In celebration of the feast of the Epiphany in Ireland, January 6th is marked by Nollaig na mBan or Women’s Little Christmas. In some households, the Christmas tree and decorations will be down and the children will be preparing to return to school on Monday. Nollaig na mBan acknowledges the graft of weary mothers and grandmothers over the festive season – in the days long before frozen turkeys and M&S prepared meals – A time when slow cooking was a way of life and not a fashion fad. This link will take you to a wonderful blog post from a few years ago by my good friend Wisewebwoman telling of this old Irish tradition of celebrating the day. Tradition dictated that the women put their feet up, while the men took care of the housework. Alas, in our house my father saw no reason to ever enter the kitchen, never mind take over the chores. Mammy had the night off once the evening meal was over. We sat round the fire and chatted until Nora & Gus arrived. The girls did not touch alcoholic drink apart from this one night in the year. Neither liked the taste of the drink, but with much crumpling of faces and squinting of eyes they managed to share a bottle between them. 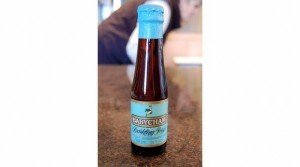 A bottle of Babycham – all of 20 or 25cls. This entry was posted in Family, memories on January 6, 2012 by Grannymar. Grannymar (you being a woman of the world) that small bottle of Babycham may not be enough for “you”. So I will send you a bottle of “Red Top Sparkling Wine” to follow it up. Red Top – Will you Courier it over yourself? That is an interesting custom. The thought behind that is truly a Machiavellian twist to male centric societies! Ramana – It was not celebrated in all counties, but has had a revival in recent years with Ladies lunches. Babycham – that takes me back! Tilly – It is an oldie, I never knew anyone else who drank it. Pingback: Grannymar » What does heaven look like?